We will pick you up from hotel in Luxor then transfer with private modern van with skilled Egyptologist guide to cross the Nile River heading to the West Bank opposite the modern city. Start at the Valley of the Kings where 62 of famous kings of the new kingdom of ancient Egypt had their tombs cut in the mountains of this area, they are such awesome art work rich with colors and decorations. Then continue to Hatshepsut temple in El Deir Al Bahary which is one of the most astonishing monuments in Egypt. It is built and dedicated to the famous female ruler of Egypt who demonstrated as a male to ascend the throne. 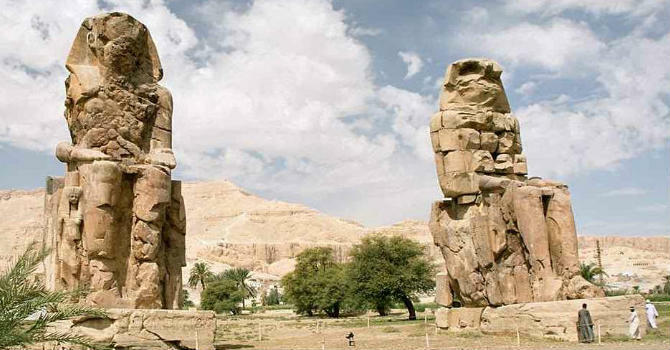 In the way back to Luxor there will be brief photo stop by the Colossi of Memnon, which reefers to the remains of the funerary temple of king Amenhotep III. The are 2 giant statues proudly at the site of an ancient complex of a ruined temples. You would also have the chance to explore an alabaster factory to purchase some genuine souvenirs for family and friends then drive back to your hotel.